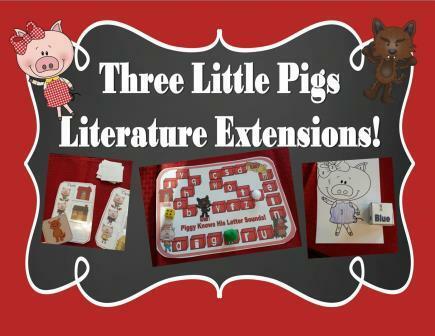 Literature Extensions for the Story, The Three Little Pigs. Games, a craft, and math and reading fun made specifically for Preschool and Kindergarten learning! The Three Little Pigs Math and Literacy Games, Centers, Glyph, and More! Hands-on is the key to learning!!! This packet is all that and more! Literature Extensions for the Story, The Three Little Pigs. Games, a craft, and math and reading fun made specifically for Preschool and Kindergarten learning! The Three Little Pigs Math and Literacy Games, Centers, Glyph, and More! Hands-on is the key to learning!!! This packet is all that and more! Page 3 and 4—Emergent reader. Student can color and bring home to share with a parent. Page 5 to 8—Three Little Pigs game. Just print and use in small group. Page 9—Color, trace, and stamp activity sheet. Number three. Page 10—Color by code. Cut-out dice provided. Print dice on cardstock and tape together to have forever. Page 11 and 12—Easy Three Little Pigs Craft page and idea. Page 13—Color cut and sequence pictures from the story activity sheet. Page 14 to 16—Story manipulatives. Laminate and add a magnet to the back to use on large white board to retell the story. Page 17 and 18—Tally and Graph activity. Printable dice provided. Makes a wonderful math center. Page 19— Color, Trace, Cut, Count and Glue—Activity sheets for the numbers 2 through seven. Page 20—Roll and Cover Math Center. Print page 20 on card stock. Supply markers and a dice. Students take turns rolling dice and marking off the number they rolled. First to cover their card wins. Great for independent game time or small groups. Page 21—Little Piggy knows his letter sounds board game. Supply markers and a dice. Students roll dice and say letter sound on the brick. First person to get to the brick house first is the winner. Page 22—Practice a skill puzzle—Laminate cards and then use a dry erase to add a skill on the bottom of the puzzle. Cut apart puzzle and students put it back together. Great for counting by 5’s and 10’s or counting up. Also good for ABC order. Page 23—A beginning sound cut, color, and glue sheet. Page 24—Three Little Pigs Glyph Activity Sheet. Great way to introduce preschool and kindergarten age kids to data interpretation!